Falafel are typically a street food indulgence featuring savory deep-fried ingredients. This recipe brings together all the bright flavors and goodness but without the deep fryer. The ingredients listed refer to other recipes on my blog, so you will need to prepare them first or acquire comparable ingredients. 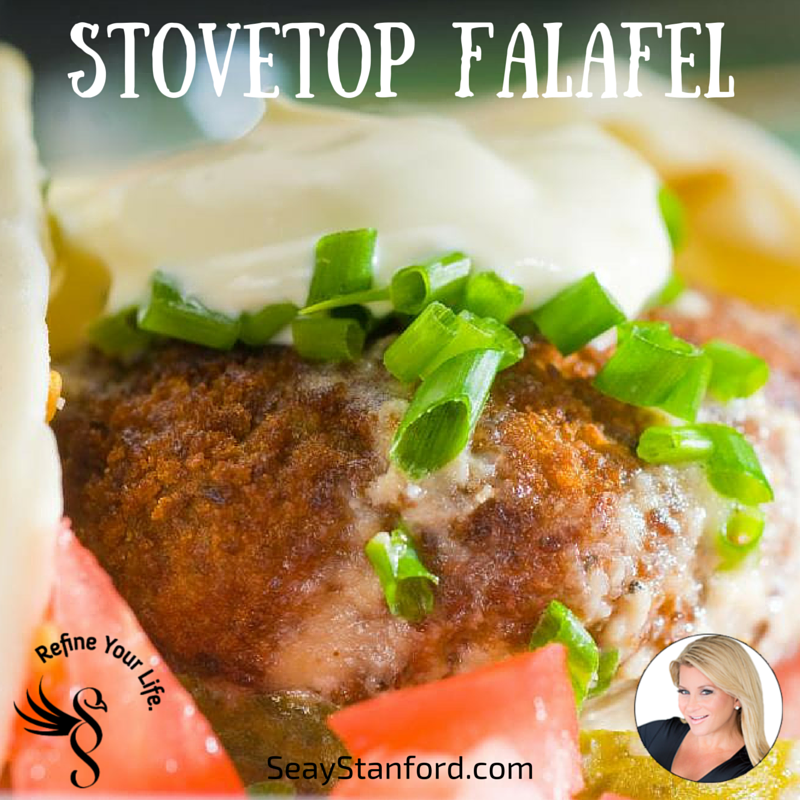 This recipe uses the homemade hummus recipe as a shortcut to making the falafel. Make a batch of that if you haven't already because you will love it! Hold the olive oil, baking powder and flour while you combine all of the other falafel ingredients in a food processor. Pulse the food processor until all of the ingredients have coarsely mixed. Sprinkle the baking powder and flour evenly across the top of the mixture then pulse until the mixture begins to form a ball, scraping down the sides as needed. The falafel mixture can be used right away or it can be refrigerated for up to five days. You may find that refrigerating it for at least a couple of hours will produce a better result. To cook the falafel form it into little balls about the size of a golf ball. Press the falafel balls into patties about 1/2 inch thick. Heat a griddle or large frying pan to medium high heat. Add a little olive oil to the pan and carefully place in the falafel patties. They are a little fragile so handle with care. Cook about five minutes per side, flipping the patties carefully. Add a little more olive oil if needed. Remove the patties from the pan when they are golden brown on both sides, before they get dry in the middle. Divide the ingredients evenly down the middle of each pita. Fold up the sides to form a sandwich for eating.